← Help! 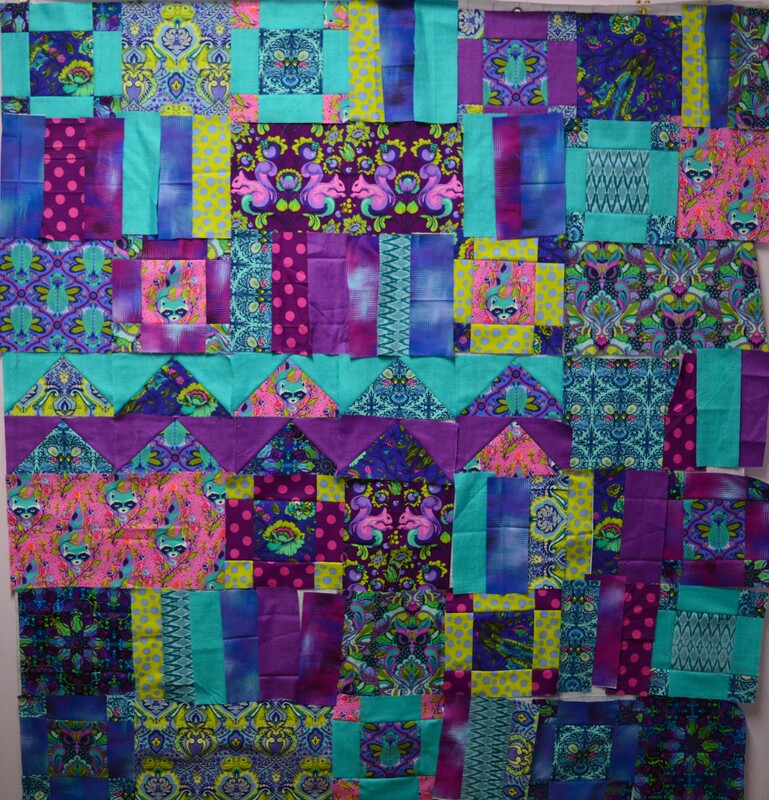 Tula Pink Panic!! Thanks for all the helpful comments, I decided to take your advice and try and be a bit braver with my colours, adding the lime green contrast in particular! I tackled it in a different way this time. Last time I started at the top and worked my way down. This time I arranged them in block order, all the triangles first, then the big rectangles, the squares, next came the pieced squares and finally I filled in with the long, thin blocks. It did seem to come together better that way. I’ll sleep on it and see how it looks in the morning. If anything screams out at you, please let me know! 11 Responses to Feeling Brave-ish! I tried to comment earlier, but it didn’t make it. My thought was to add the lime greens in the blocks so there would some “pop” of colors. Before the greens were added, the blocks all had the same color value. I think this is much better! Good luck! That’s better! I’d only suggest that you swap out a couple of those darker blocks at the bottom for lighter ones from the top, as the impression is that it’s much darker at the lower edge – which could be just the photo, of course. I think you’ve got it almost right now! Well done, lime green adds zing and looks great. I am not a quilter. I looked up this fabric, it is fantastic. I really liked the inspiration quilt on the site. They “highlighted” the animals in their own sections with the solids, stripes, dots around them. I love those animals. And the colors. I agree with the other comments the bottom is darker, but I think that is because you have more of the solids up higher. That turquoise-ish color helps to break up the “busyness of the prints. Your overall color choices are great. Good luck with this. I like it so far, and I so admire everything you do. You are an inspiration to me. The spotty fabrics really help to make it pop! Might we see lime green sneak into some of the quilts you keep for yourself?! Wonderful – I love all those colours and it’s going to be a stunning quilt that someone will really treasure. So much better. Incredible how the addition of one colour lifts the whole thing.